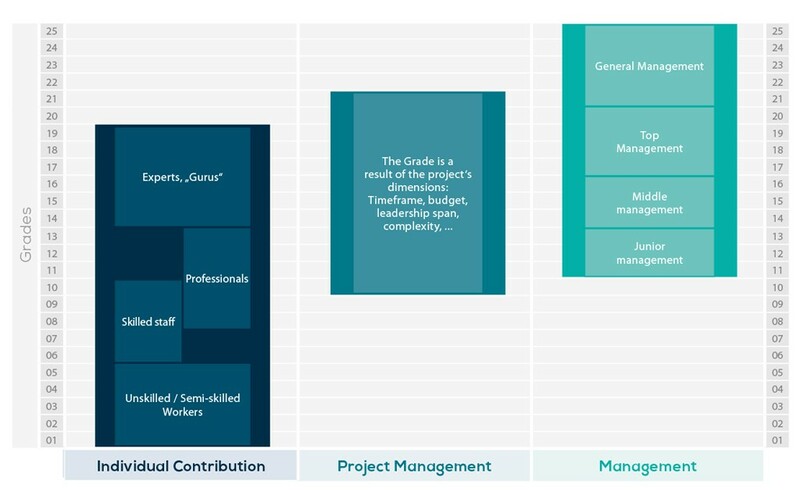 gradar is the analytical job evaluation system of QPM. It was designed as an easy to use and understandable expert system and is thus suitable for all kinds of businesses. The gradar licence fee amounts to 5,000.- EUR p.a. for the Enterprise Version or 2,500.- EUR p.a. for the Professional Version. The prices are to be considered plus VAT and entail the provision on a server in Germany as well as technical support. Consulting and training is not included in this price. The factors are free of overlaps. Thus double-weighting and favouritism are prevented. The evaluation and classification of a job is done according to a system of factors which in qualitative and quantitave level specifications describe the demands on the job. These factors allow for a consisten job evaluation across all career paths. Thus gradar allows for a fair, realistic, understandable job evaluation free of age and gender discrimination. For this unique solution for small and medium sized businesses, an algorithm was developed which is based on current findings of work science and organisation theory. The system is marked by being free of overlaps. Thus double weighting or favouring of one specific career model are avoided. Here you can get an insight into the significance of reward management, analytical leadership or people developement for your company.